Before beginning a grass skirt project, you will need to consider the materials you will be using to make your grass skirt. 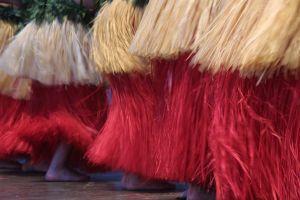 An authentic grass skirt is made of plaited, braided grasses, but these may not be readily available to you. Alternative materials include raffia, paper streamers, newspaper covered in crepe or tissue paper, or even a green or beige garbage bin liner. Some of these options are more durable than others, so if you will be doing a lot of moving or if the costume is for a young child, pick a material which can withstand some abuse. This is the center of your skirt. The waistband is the area where your "grass" will be attached. In order to create a waistband, you will need to use some type of fabric or flexible material which can be tied. Felt makes an excellent waistband since it comes in many colors and can be cut without fraying or raveling, saving the need for sewing. Using a tape measure, measure the area around the waist. Add 8 inches or so on either side to leave room to tie the skirt - this is your total waistband length. Create a rectangle of fabric that is about 4 inches plus the length of your waistband. Cut this out and you are ready to begin. Deciding how to make a grass skirt depends on what materials you are using. Different materials will require different methods of attaching your "grass" to the waistband. Glue, sewing and stapling are all fast ways to get your grass skirt ready to go. Raffia is a grass-like material and is much finer than the other options. It should be sewn in place and can be machine sewn for a more secure finish. For this option, use a 2 inch wide waistband instead of a 4 inch wide strip. Fold the raffia in half over the waistband, leaving the final 8 inch free on either end for tying, and then sew into place. Trim the raffia length to about knee level. This creates a secure, beautiful grass skirt. To create a grass skirt from paper streamers, cut a roll of green or tan party streamers into equal lengths. Staple or glue these streamers to the waistband material about 2 inches from the top, leaving room on the ends of the waistband to tie the skirt. Fold the top of the waistband over the glued or stapled streamers and secure in place. This option is somewhat sturdier than crepe streamers. Open a sheet of newspaper and cut 2 inch wide strips down the long side. Using glue, attach green crepe paper or tissue paper to both sides of the newspaper strip and allow it to dry. Once these are dry, you can attach them to the waistband by sewing, gluing or stapling. Trim the "grass" to a knee length evenly around the skirt. This is the ultimate in simplicity! Cut open a beige or green garbage bin liner and cut strips of this durable material. Like the durable crepe and newspaper strips, these can be attached to the waistband by gluing, stapling or sewing. Crepe paper flowers make an excellent finishing touch to a grass skirt. They can be attached at the waistband at the front or hips to accentuate your hula dance. With these quick costume ideas, you're sure to be doing the hula dance in no time!